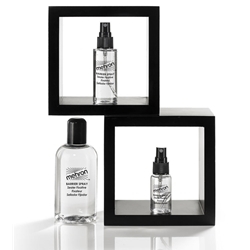 Barrier spray by Mehron, is a clear, alcohol-based, cosmetic grade film that is designed to create a barrier between the skin and the makeup. When applied to clean, dry skin, it reduces sweating from behind the makeup and provides protection from allergic reactions to makeup, latex and adhesives like spirit gum. It allows the makeup to be applied evenly and retards staining from pigments. Best of all, after the makeup application it can be used as the final seal for the finished makeup too!! Mehron Barrier Spray is available in 1oz, 2 oz or 9 oz refill. Also available in case of 12 - 2oz. bottles.